Project obstacles and solutions: The Community Cancer Center in Anderson, Indiana was adding a linear accelerator to its facility. The linear accelerator allows patients to receive radiation treatments to any area of their body. This required a two room expansion that included a therapy room that was completely encased by concrete to eliminate any radiation leakage, and a control room. Hagerman Construction was chosen as the general contractor for this project. This project was on a quick turnaround for construction. 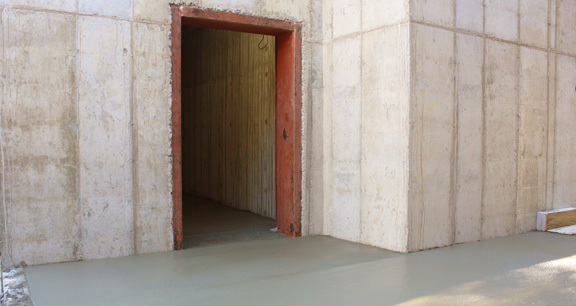 Given the thickness of concrete needed to control the radiation in the therapy room, IMI suggested that the floors be poured with Aridus Rapid Drying Concrete. Aridus is chemically mixed to eliminate water inside the slab. Instead of internal moisture escaping from the surface of the concrete, Aridus Concrete dries at the core. This greatly reduces the relative humidity (RH) problems that can plague floors that are finished with a floor covering that is adhered with mastic. When applied before the concrete slab dries out, the escaping moisture can dissolve water-based mastic. This causes loose flooring and bubbling issues that can only be remediated by clearing out the room, tearing out the old floor coverings, drying out the concrete or putting down a chemical barrier and laying down a new finished floor. Not only is this costly, it shuts down any business at the facility until the problem is resolved. This was not an option in a healthcare facility of this kind. IMI monitored the RH of the floors with in-floor probes. One probe was placed inside the enclosed therapy room. The other probe was placed in an adjacent room that was left open to the weather elements until the roof was completed 9 weeks after the concrete was poured. The target RH is 80 percent. At this level, flooring adhesives are guaranteed to stick to concrete without breaking down. The therapy room broke the 80 percent RH barrier 8 weeks after the floor was poured. Within two weeks of being completely enclosed, the adjacent room also achieved the 80 percent RH reading. Finished flooring was installed and the project was kept on schedule.